We are such an interfering & hypocritical species it's no wonder planet earth and its divisive human populations are in so much turmoil. At what point did the big man upstairs ask us to to stick our ignorant noses into his planetary designs and wonderful wildlife assets! Wild Atlantic salmon populations across the world have been diminishing for decades for multiple reasons however the 'man made' issues unquestionably far outweigh the scientific ones. These 'man made' issues are also the ones we can address as fixing ongoing global fluctuations in oceanic temperatures (if indeed factual) are way beyond our ability and remit. 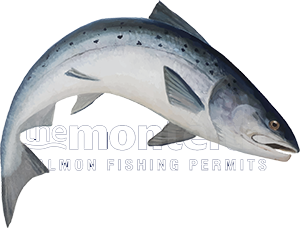 With that hard fact in mind why not just introduce 'common sense' back into the management of the wild Atlantic salmon and wind our scientific time wasting 'money sapping' necks back in to where they truly belong! Our species has allowed many things to become imbalanced and the rivers of Scotland are a great example of this. Look at the long term effects of commercial forestation and how huge areas of the Scottish hills have lost their ability to retain & slowly release water and how that negatively impacts riverbeds that salmon are so dependent upon via excessive sedimentation movement during periods of heavy rainfall. Look at agricultural crop spraying and where cattle are often freely allowed to the riverside causing erosion and riverbank failure issues. Look at the hydro electric schemes and how they have 'choked' the ability of many Scottish rivers to naturally 'breath' and replenish during flood conditions the very gravel beds that are vital for salmon reproduction. Don't ignore or be ignorant towards the geo-engineering that's been going on for years and if you don't know what I'm talking about simply raise you vision skywards! Take these basic above issues and ask where were the scientists with their God preaching lectures and waffling egotistical guesswork to put the block on the above ongoing ecological destruction! Where were the scientists to stop Scotland's magnificent wild brown trout fisheries being invaded by the rainbow trout infestation that assaulted Scotland in the 70's. Where where they at the birth and ongoing support of 'aquaculture' that completely destroyed the West's wild salmonoid populations. Where were the scientists when the reintroduction of an 'invasive' beaver species was being 'master minded' and why were our native otter populations not given consideration knowing fine well they are protected and were never ever going to gel too well together which has been the case as more & more otter/beaver fight videos are frequently posted on social media and what about the otter holt 'evictions' the beavers have caused that the scientists haven't yet conveniently mentioned! Take the River Tay for example where there's massive & completely unchecked 'in-river' predation going on via (& in priority) 'huge' predatory wild brown trout juvenile salmon killing machines that hunt 'highly effectively' through each night, hundreds (if not now thousands) of pairs of (invasive) saw billed ducks which not only consume unquantifiable masses of salmon fry, parr & smolts through daylight hours but death sentence hundreds of thousand of additional juvenile salmon 'escapees' via injury which kills them when they unsuccessfully try to migrate to salt water and the scientists still hide behind the 'smoke screen' that we're sending enough juveniles to sea even though they cannot factually prove that! Hatchery operations that are geared to artificially planting out eggs that a hen salmon is better placed to decide the location of or planting out young fry subjecting them to a 2 year exposure to the above 'deadly' predation have no chance of surviving river life is never truly going to make a significant difference. Science is wonderful but when the human brain with its large ego and limited capacity is applied it's very easy to 'over think' things to justify the cost of that scientific research. Mother Nature simply tracks back to the Sun and beyond and planet earth is simply one big gigantic 'work in progress' and always has been since the big bang! To counteract the massive imbalance our species has now officially brought to the table in its 'infinite' wisdom wild Atlantic salmon (beyond any shadow of a doubt) need a natural boost & 'thoughtful' helping hand if their survival and commercial angling viability is to be maintained and developed for the benefit of the species and for Scotland. If you've taken 'national' responsibility as a river manager or river board chairman the time for waffle is well and truly over. Don't mess about with meaningless hatchery outputs or blaming oceanic issue that have always been present as now is the time to take matters by the scruff or the neck and give this amazing species a 'natural & proven' helping hand.